Alternative but rather lengthy title: I should have listened to my old father when he said to me "Son, if I ever catch you trying to organise a crew for the Boston marathon, I'll nail your head to the floor". Ahem. But it all worked out brilliantly in the end, so doubtless we'll have another go next year. If there's one thing I'm really good at, its not learning from experience. As you can probably guess from the picture here of us all smiling, we won! Our category, not the fastest time overall, but we did win at IM2 despite being humble IM3 folk; and we were the fastest sweep-oared boat this year, and 6th overall. We came in 3:56 (2:21 split, including time at the lock. Our GPS track is here from Garmin connect though it shows up better on Strava - you might want to think about that, Garmin people). 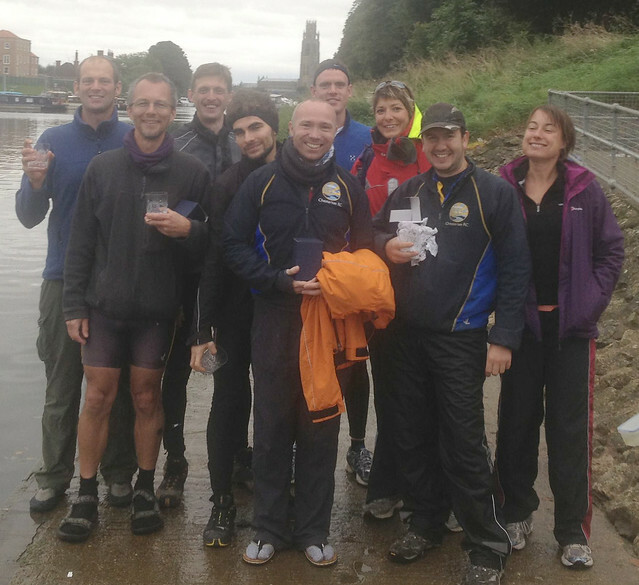 The overall winner was an 8x+ in 3:35, which was a fine effort in the conditions. Speaking of conditions (a tail wind to start off, though it didn't last all that long, followed by headwinds for much of the course): my rough and approximate calculation (based on looking at the ratio of Master's scullers across categories C-G, because there are lots of these and the winning times are quite consistent) is that the weather, and headwinds, this year was worth a 0.94 correction factor over last year (this turns out to be quite important later on :-). Which would have made us 3:42 last year, if anyone cares about that. Who were those masked (wo)men? Our fine crew was: James Tidy, cox. Kate Hurst, stroke; William Connolley, James Howard; Ian Foster; Ralph Hancock; Luca Simonelli; Ulrike Bauer and Paul Holland, bow. Therein hang several tales, and it is only fair to list our fallen comrades. 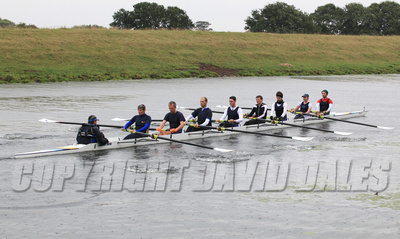 The original intent was to enter the Great Eight that went up three to 9 in bumps and won IM3 at Peterborough. And that was what we sold to James Howard - with, perhaps, the possibility of one or two exceptions - when he agreed to come down from the Frozen North to reprise those events. But Mr Wykeham couldn't make it due to Hols, and Chris "old man" Wood couldn't make it due to creaking, and Dr Southgate needed to regenerate in his coffin, so we roped in Paul "slag" Holland, Luca Simonelli and Tom "legendary" Watt. That crew lasted about 5 seconds, or possibly an outing, when Dave had a family event, but happily Kate Hurst quite fancied it (or perhaps us :-) so we were a crew again. What could possibly go wrong now? The answer was Tom's creative ability to injure himself, though to be fair a half ironman is tough, and we were running out of insane rowers, but fortunately Ulrike "mad as a bucket of frogs" Bauer also fancied trying her hand at Boston, so we were on again. 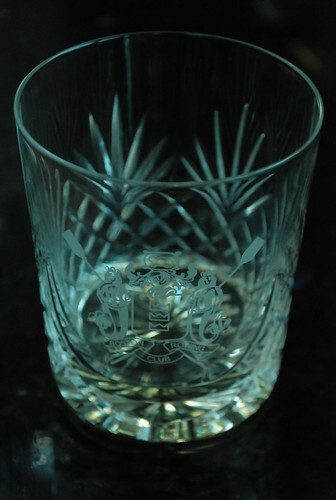 It's time for a picture of our "pots", which were rather fine cut-glass tumblers well suited to drinking whisky from; seen here in rather greater detail. But enough gloating; on towards the race. However, no post about Boston would be complete without mention of transport, logistics, and trailering problems. In this case our chief problem was unusual, a choice of competing trailering possibilities, but we went for the cheap option of hiring and driving Queens' trailer and driving ourselves. This had the advantage of not depending on anyone else, but the disadvantage of needing to turn up two hours early, leave the boat (and some of the crew needed to be there early to put it together), drive the trailer to Boston, get picked up by someone else, and then drive back to Lincoln for the start. It all worked, though it made for a long day. And since we got lost in the Lincoln one-way system coming back for the start, we had a pretty harried rush-to-the-start. On with the race. So, we're in the start queue, waiting for our chance to move down to the pontoon, careful of the wet grass. But contrary to the dire forecasts, it isn't actually raining at the moment, and for a mercy there's actually a tailwind blowing towards the start line. We boat, hurridly, and they're keen to push us out ASAP to get the last few crews off, so we're sitting in the stream making the last few adjustments. Newbie cox Mr T tries to take us over the start line before they're ready for us (they start at 1 min intervals, its not like a head race when they start you when you're ready) so we back down and try again. We're off! Almost immeadiately there's a problem: the cox-box isn't working in the bows (such a shame there wasn't 1.5 hours to put the boat together and check everything before the off :-). Dropping out a pair enables Ralph at 4 to fix this moderately quickly, but I see the next crew - Liverpool Victoria, the other IM2 8+, coming up on us. Happily as soon as we get back to rowing all eight we drop them quite rapidly. At least, I was pretty sure they were LV which if true was great news - they were the only other crew in our category (we entered as IM3, which is what we were, but they bumped us up to make a cat). But more interesting than that was our probable time. I'd estimated before the race that 5 mins at the lock and a 2:15 split would get us 3:45; James Howard and Kate, more optimistic than me, had told the Boston commentator that we would do 3:30. My GPS was showing some pretty promising splits - up to 9.5 km, we were averaging 2:00 or better, with a tailwind (incidentally, we'd taken off the impeller for that tiny-extra-speed for bumps, and hadn't put it back on since, and didn't put it on for Boston due to Weed (not that there was much this year) so James T was relying on Kate's GPS rowcoach, which he'd never used before. And all its splits were vastly optimistic, by 5-10 pips. No idea why. I didn't say anything during the race). But after that we hit moderate-to-strong headwinds, and those persisted, and our splits correspondingly dropped. Looking, now, I see that 9k is where the river turns from due East to SE. At 42 k, where the river turns East again, our speed picks up, then drops at 46 k as it heads SE again, until our final spurt over the line. But I'm getting ahead of myself. Bardney comes up quicker than you think. And I always forget the "shape", so here's a pic of my GPS track. The "offical" split times for the course are calculated assuming 5 mins to get over. I thought, this time, that we'd done pretty well, but it turns out we took 6:30. 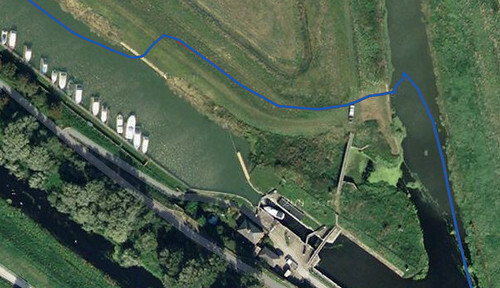 That breaks down into (something like, its hard to reconstruct exactly from the trace): 50 secs coming into the stage (partly due to City, partly due to a scull so James took a slightly non-optimal glide-path and we need to stretch and be pulled in); about 1:20 getting out of the boat; about 2 mins going from one side to the other (we were handbagging it to save faffing with blades; this is Correct); about 2 mins pushing off, reassembling ourselves on-water, and getting ready to go. Our thanks to the City eight who, clearly slower than us, allowed us to push past them for the re-boating stage. To do it faster you need: a clear stage to come into, fast (which needs either luck, or someone on the other end of a mobile phone to clear it for you; or, perhaps, arrange a water/food break just before the lock rather than after, if there is no space); a crew well practiced and prepared to leap out and go; and a clear exit stage. And so, on to the next three quarters of the race. This passed surprisingly quickly. I distinctly recall in earlier times - admittedly, when I was in slower-moving boats - that the last 20 or 10 k crawled by. This time the higher rating (we started around 22, rose through 23 to 24 after perhaps 10 k, held that for most of the race and raised to 25 for the last 10 ish k, with a virtuoso sprint up to 31 over the line) gave far less time to gazing around, and I had to actually concentrate on staying in time and stuff like that. Actual rowing. Which was nice. I barely looked at any scenery at all - not that there is much of it. We were going for a moderate-to-high rating for such a long distance, trying to keep the technique light and the pressure, if not light, wasn't too high. As with any such long-distance event it starts off feeling easy and ends up feeling terrible; with rowing there is always the problem of blisters, and we ended up with a fair crop. The boat had a variety of precautions: some had gloves of various sorts, some had used various forms of tape, others were just Hard. I (I'm writing this for my own information next year, you understand) found that fabric-type tape around the middle bit of two fingers on the pulling hand and one on the feathering worked well, combined with lightweight running gloves to ease friction and stop the plasters from rubbing off. My worst blister was one inside the thumb on the pulling hand. Or claw, as it became for the last 10 k. But that's the ideal, isn't it ;-? I used a gel seat pad, and I had no "bottom" problems at all. By about, say, 30 k it was clear that we weren't going to hit our 3:45 (let alone 3:30) unless the headwind eased off, which it didn't. By 40 k it was more a matter of wanting to get in under 4 hours; but I'm moderately sure I was the only one of the crew staring at a GPS and calculating probable finish times given certain splits as we went along. At 40 k we needed a 2:30 average split from then on to get under 4 hours, which was pretty likely, and as time went by and we kept hitting 2:20 ish it became more and more certain. This time, we had the pleasure of overtaking boats. Lots of them. That's a nice feeling, and also something to break up the monotony, and something to give you a chance for a slight lift to keep up the pace. And it definitely beats being overtaken a lot. Fairly soon after the lock a double appeared in the distance behind us. Slowly slowly slowly it crept up on us; I think we pushed a little to hold them off, and once or twice they got a bad corner whereas James T's coxing got us good lines. But then they caught us and came past, again slowly. But that was the only crew to pass us, and they ended up fourth overall. Is there anyone here from Chesterton Rowing Club? Yes indeed there is! And yes we'll happily take some of those rather nice pots off you. Technically I think we were a Chesterton / Cantabs composite (for Ulrike). But never mind the fussy details. After that, well, it's time to go home. And this really did feel like the End of the Affair. We'd stretched our the eight to Peterborough and (just!) to Boston, but now the season is over. We say goodbye with regret to James Howard and wend our way back to Cambridge to put away "Octo" in the rain and a final pint in the Waterman. The End. Or, vaguely useful advice. See also last's years thoughts. * It isn't 50 k; its 49.1. Don't be fooled by the distance markers, because while it ends at 50 it starts at 1 (work it out :). * I've been advised that driving yourself / your trailer back afterwards is dangerous / a bad idea: well, your mileage may well vary, but we didn't find any problem, after an hour's rest. * Having now tried it, I advise mostly energy gels for food if you're in a hurry, with perhaps a banana or two to be eaten if you happen to have a bit more time for whatever reason. I didn't finish my litre of water. ps: did I ever mention how much I loathe the awful auto-formatting that blogger does?